Lindy Brady specializes in Old English, medieval Irish and Welsh, Old Norse, and Anglo-Latin languages and literatures. Her research interests include multilingual and transcultural approaches to the Middle Ages, the role of the landscape in literature, and representations of identity in medieval texts. 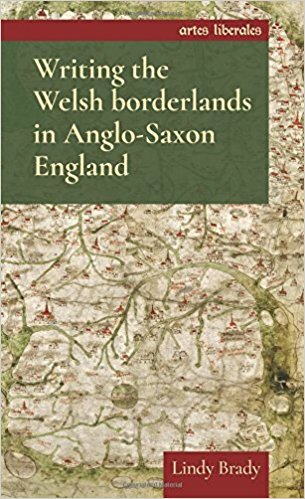 Her first book, Writing the Welsh borderlands in Anglo-Saxon England, was published by Manchester University Press (2017), and her current book project is entitled Framing History in the British Isles: The Origin Legends of England, Ireland, Scotland and Wales. Other ongoing projects include a collection, Origin Legends in Medieval Europe, co-edited with Patrick Wadden for Brill’s Reading Medieval Sources series, and a series of editions and translations of late-medieval alchemical texts co-edited with Andrew Rabin. Lindy has been a Text Technologies Fellow at Stanford University in June 2015, the A. W. Mellon Postdoctoral Fellow in Medieval Studies in the Medieval Institute at the University of Notre Dame for the 2015-2016 academic year, and a British Academy Visiting Fellow at the University of Birmingham during the summer of 2018. She also reviews scholarship for the “Poetry” section of the “Year’s Work in Old English Studies” for the Old English Newsletter with Jordan Zweck, serves on the executive committee and as a delegate assembly representative for Celtic Studies at MLA, is the Celtic Studies book review editor for Speculum, and is a member of the International Advisory Board for the Richard Rawlinson Center for Anglo-Saxon Studies and Manuscript Research at Western Michigan University’s Medieval Institute. 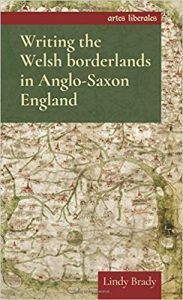 Writing the Welsh borderlands in Anglo-Saxon England (Manchester: Manchester University Press, 2017). Old English Tradition: Essays in Honor of J. R. Hall, ed. Lindy Brady, Medieval and Renaissance Texts and Studies Series (Tempe, AZ: ACMRS, the Arizona Center for Medieval and Renaissance Studies, 2018). Early English Poetic Culture and Meter: The Influence of G. R. Russom, ed. M. J. Toswell and Lindy Brady (Kalamazoo, MI: Medieval Institute Publications, 2016). “Crowland Abbey as Anglo-Saxon Sanctuary in the Pseudo-Ingulf Chronicle,” Traditio 73 (2018): 1-24. “Late Medieval Irish Kingship, Egerton 1782, and the Irish Arthurian Romance Eachtra an Mhadra Mhaoil (‘The Story of the Crop-Eared Dog’),” Arthurian Literature 34 (2018): 69-87. “An Analogue to Wulf and Eadwacer in the Life of St. Bertellin of Stafford,” The Review of English Studies 67 (2016): 1-20. “Colonial Desire or Political Disengagement? : The Contested Landscape of Guthlac A,” Journal of English and Germanic Philology 115 (2016): 61-78. “An Irish Sovereignty Motif in Laxdæla saga,” Scandinavian Studies 88 (2016): 60-76. “The ‘Dark Welsh’ as Slaves and Slave Traders in Exeter Book Riddles 52 and 72,” English Studies 95 (2014): 235-55. “Death and the Landscape of The Fortunes of Men,” Neophilologus 98 (2014): 325-36. “Feminine Desire and Conditional Misogyny in Arthur and Gorlagon,” Arthuriana 24.3 (2014): 23-44. “Apples on Willow Trees: a Metaphor for Grafting and Spiritual Succession in the Early Irish Saints’ Lives of Berach and Coemgen,” Proceedings of the Harvard Celtic Colloquium 31 (2012): 56-73. “Booklet Ten of Peniarth 359: An Early Modern English Astrological Manual Encoded through Welsh Phonology,” Studia Celtica 45 (2011): 159-83. “Echoes of Britons on a Fenland Frontier in the Old English Andreas,” The Review of English Studies 61 (2010): 669-89. “Three Swords of Doomed Inheritance in Beowulf,” forthcoming in Old English Tradition: Essays in Honor of J. R. Hall, ed. Lindy Brady, Medieval and Renaissance Texts and Studies Series (Tempe, AZ: ACMRS, the Arizona Center for Medieval and Renaissance Studies, 2018). “Boars and the Geats in Beowulf,” in Early English Poetic Culture and Meter: The Influence of G. R. Russom, ed. M. J. Toswell and Lindy Brady (Kalamazoo, MI: Medieval Institute Publications, 2016): 61-72. “‘Arnold of the Newe Toun’ Revisited: A Note on the Sources of the Canon’s Yeoman’s Tale,” with Andrew Rabin, Notes & Queries 65 (2018): 174-77. “St. Bertelme of Fécamp: St. Bertellin of Stafford by Another Name,” Notes & Queries 63 (2016): 194-96. “Antifeminist Tradition in Arthur and Gorlagon and the Quest to Understand Women,” Notes and Queries 59 (2012): 163-66.